Often when people think of landscaping, they think of big green lawns dotted with trees, shrubs, and exotic plants in mulch beds, and that certainly is part of what’s available. 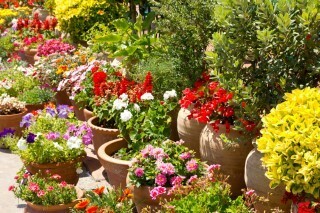 However, it would be a shame to overlook the beauty and utility of potted plants when making your landscaping plans. Potted plants excel in their versatility of placement. If you’ve got an air conditioner you’d like to block from view, or perhaps your washroom window is just a bit too visible to the outdoors, then a potted plant is a quick, simple way to add vegetation to the area without having to go through a full installation or revamping the entire plan. You can also use hanging pots to spruce up sheds, fences, and other outdoor structures that may be a bit bland on their own yet don’t always lend themselves well to installed plants. Potted plants also add colour to outdoor steps and patios. Potted plants are easily rearranged when you need more space; you can use them to close off or open up sections of the yard so that people feel comfortable when you’re holding gatherings, no matter what size. Potted plants should at least be on the radar when you’re considering modifications to your landscape. For more ideas on the use and procurement of potted plants for your yard and how to best incorporate them into your landscape design, feel free to give us a call at (647) 955-8382.